Hong Kong, China (April 9th, 2018) – SLR Magic will present a new family of CINE lenses, MicroPrime series, to the public in the upcoming NAB Show 2018 in Las Vegas at the SLR Magic booth (Upper Central Hall, C-2663). 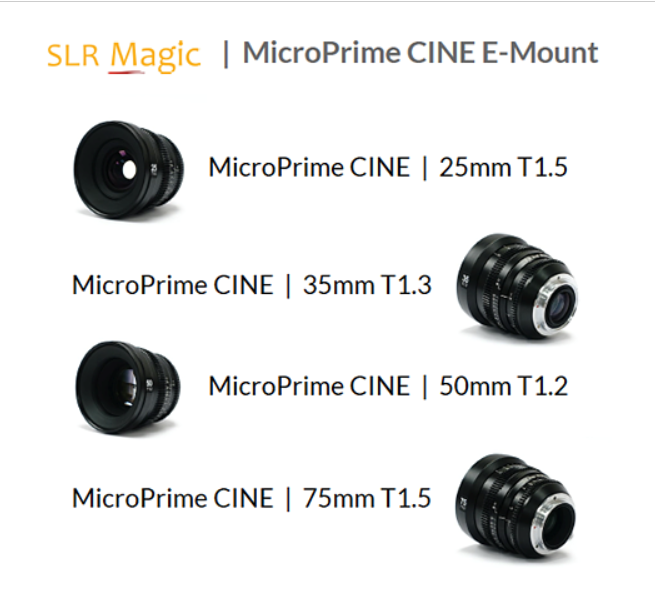 The SLR Magic MicroPrime CINE 25mm T1.5, 35mm T1.3, 50mm T1.2, and 75mm T1.5 are the first lenses of the family. The SLR Magic MicroPrime CINE lenses are designed to be compact and robust for use in a professional setting. The MicroPrime CINE lenses have a large image circle that covers up to full frame. Witness markings on the lenses are all calibrated for the accuracy professionals need in the field. Each lens is balanced, with a similar weight distribution so that recalibration is not required upon switching lenses when using a 3-axis gimbal. Lens gears are built-in with a throw slightly longer than photographic lenses but still manageable when a motorized follow focus is not used. Each lens features an internal focusing mechanism, and comes with a standard 85mm diameter suitable for matte box use. In the situation where a smaller setup is required, each lenses also comes with a 82mm filter thread for use with 82mm Fixed ND filters. We place the highest priority on the development of our lenses, to fulfill the demands of professional cinematographers. SLR Magic is exhibiting the first lenses of the MicroPrime cinema series at the 2018 NAB Show. The SLR Magic stand will be in upper central hall (C-2663) during the show, which is to be held in Las Vegas from the 9th to the 12th of April 2018. The SLR Magic MicroPrime CINE 25mm T1.5, 35mm T1.3, 50mm T1.2, and 75mm T1.5 (MSRP: $800 US) will be available from authorized SLR Magic dealers starting in May 2018. The SLR Magic 18mm T2.9 will be ready by Q3 2018.